As the sun has been so hot I thought it would be a good idea for the children to build a den to provide some shelter. 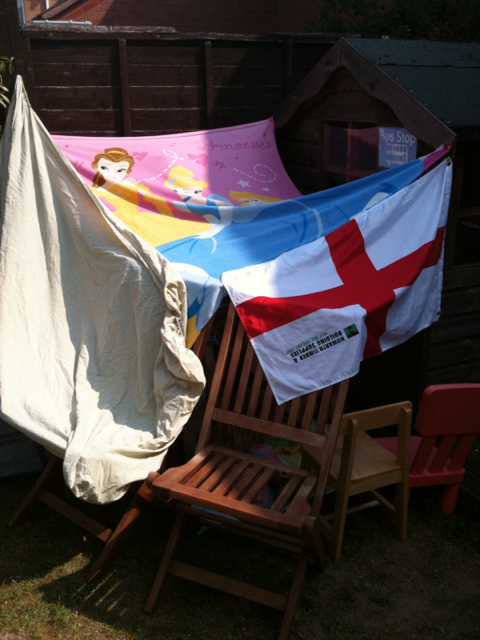 We found some blankets, sheets and flags which we attached to the fence and play house using drawing pins. The children thought it was fantastic. They sat in there on a cot quilt for hours. I was told that lunch was to be served in the den. This morning we popped to Asda to see if we could find a cheap king sized sheet to use to build a better den. They were all expensive but they had a sale on curtains. We found a pair of tab top curtains reduced to under £5. My sewing skills are poor but I'm going to try to join the two curtains. Martin is going to put some cup hooks along the side of the house and fence. The children will be able to hook the tabs of the curtains onto the hooks and make their own den without any adult input. I've got some fabric wax crayons (a previous Asda sale bargain) that they can use to decorate the sheet. Today is the last working day of the Easter holiday. I don't work or charge for Bank Holidays unless a parent specifically needs childcare. The two week holiday has flown by. I was quite nervous at the prospect of having six children here daily. February half term was hard work as the weather was dreadful. I'm actually feeling quite sad that the holiday has come to an end, I've really enjoyed the week. I'm looking forward to the long weekend to spend time with my own children. The holidays are always hectic but make a lovely change from the routine of school runs, ironing uniforms and making packed lunches.